At least 10 Britons have been injured in a speedboat accident off the icy coast of Norway. The boat was involved in a collision with a fountain while travelling at speed, near the town of Harstad. A spokesman for the holiday company Inghams said: "Our local team in Harstad, Northern Norway has advised they are assisting 10 guests who took a boat excursion as part of their 'Arctic Fjord' short break." Some 24 passengers were travelling on two boats on a sightseeing trip, around 875 miles north of Oslo, Norway's capital. The passengers of the vessel involved in the collision were thrown from the boat on impact at around 3pm local time (2pm GMT). It took 15 minutes before emergency response could rescue them from the freezing water. 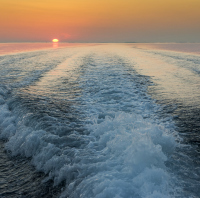 Anyone planning a trip that includes speedboats and watersports should take out specialist travel insurance. The passengers and tour leader were all taken to hospital in Harstad with minor injuries. The Inghams spokesman added: "Six guests and our tour leader are reported to have minor injuries. Of these six, four guests and our tour leader are staying overnight in Harstad hospital on a precautionary basis." "We are ready to support British people affected," a statement read.